When the overdrive switch is turned on, the transaxle will automatically upshift to the second, third and overdrive gears. When the overdrive switch is turned off, the transaxle will not upshift to the overdrive gear. 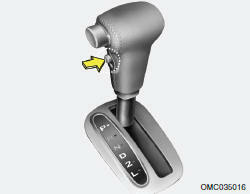 For normal driving, the selector lever should be left in the "D" position and the overdrive switch turned on. If you need to accelerate rapidly, press the accelerator pedal all the way to the floor. The transaxle will automatically shift to a lower gear, depending on the vehicle speed and load.